This is a very interesting but somewhat unsatisfying film. Esse filme é tão monumental na sua estranha forma de narrar e Hossain Sabzian representa o cerne da cinefilia de tal forma que não há como explodir em lágrimas como o "protagonista" desse documentário encenado. Que coisa linda. DVD Obras-primas do Cinema Abbas Kiarostami. Mar 15, 2018 cenk k.
A unique production that aids the delivery of this intriguing story. The blend of documentation and fiction finds a way to bring out the psyche and emotions from Sabzian as we learn about the actual events. I was absorbed in Sabzian's mental as he reasons his actions in court. 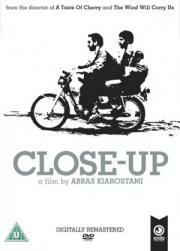 Kiarostami's ability to bring together the people actually involved and retell it without over-fabricating the film is genius. Jan 13, 2018 Yasin M.
We all have our reasons for loving cinema as much as we do. For many, escapism is high on the list and it is no surprise that this can be taken literally as well. Kiarostami's film is many things, but, for me, it explores the importance of the power of escapism and how it causes us to reflect on what makes us an individual. The film is like nothing else I've seen before. A masterpiece.